This week, the Recombinant DNA Research Advisory Committee, an advisory body to the US National Institutes of Health, gave its go-ahead to the first clinical trial of the gene editing tool CRISPR-Cas9 in humans. While the trial must still be approved by the Food and Drug Administration and other ethics review bodies, it represents another major milestone in the rapid progress of gene editing technologies towards clinical application. The proposed therapy uses CRISPR to edit immune cells taken from cancer patients, which are then infused back into the patients with the hope that the edited immune cells will destroy the patients’ cancer cells — a personalized medical treatment called “immunotherapy”. While this clinical trial, if eventually approved, would be the first use of CRISPR in humans, immunotherapy trials making use of other gene editing tools are in progress — a hospital in the UK used a molecular tool called TALENs to treat a baby girl with leukemia last year, and a clinical trial for that particular therapy officially started last week. While promising, the clinical use of CRISPR, which has garnered much attention in the past couple of years for making it dramatically easier to alter DNA, still faces a few technical hurdles. Another source of concern is the affordability of such a therapy. Treatments that make use of gene editing fall into the broader category of “gene therapies”, which aim to treat diseases at the genetic level by, e.g., replacing a non-functioning copy of a gene with a functional one. While no gene therapies have yet been approved in the US, two therapies are approved in Europe, including one approved at the end of May for the “bubble boy” disease. However, such treatments can cost as much as a million dollars per person, which would put them out of reach for many patients. To maximize the health impact of these potentially life-saving therapies would require finding solutions to address the issue of cost. 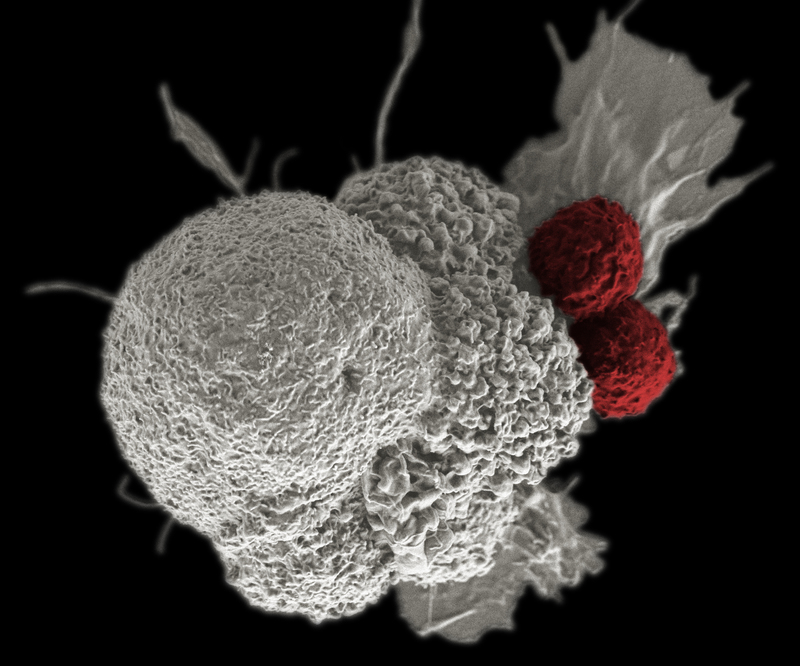 Immune cells (red) attacking cancer cell.